As I have discussed here before, it can be a pain keeping track of your billing in six minute increments. It is even more of a chore to keep track of time when you are on the go. Trying to go back and recreate a day or a week out of the office can be difficult and you are more likely to, in the famous words of Roger Clemens,”misremember” just how much time you spent on various tasks. Recently I purchased iSlips from Brain Freeze Software to try to make my life easier by entering my time and expenses when I’m out of the office and make more money by capturing my time and expenses more accurately. 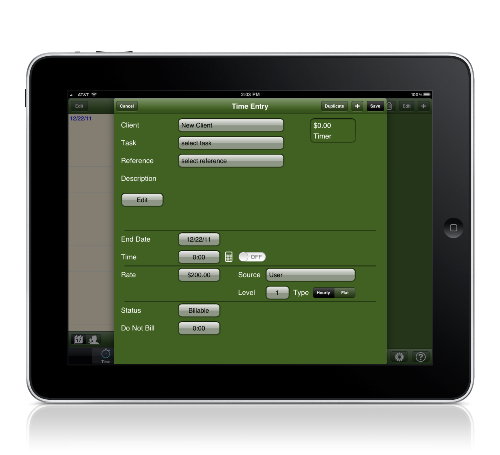 I downloaded the software onto my iPhone and iPad and within minutes our client list of over 2,000 accounts, including the reference fields for each client, and the task descriptions we use were transferred from our Timeslips database to the iSlips app. One of the best features for mobile time entry is the abbreviations used in Timeslips transfer to the app. For instance, I created an abbreviation in Timeslips so that when I type “rre” the software converts the abbreviation to “Reviewed and responded to email from” upon hitting the space bar. With iSlips I can do the exact same thing, which makes entering a description much quicker on the mobile device. I am going to go back and create many more abbreviations to take advantage of this feature. Data can sync wirelessly, with a cable, or by email. I had some trouble with the wireless syncing but the company founder, Steve Stasinos, was very prompt and helpful in addressing my problems. The email sync option will be particularly helpful for my boss. He will be able to input his time in the app and then email the file to his secretary. Once she receives the file, all she has to do is import the file with the free iSlips Sync software and the data is seamlessly sent to Timeslips. I am always searching for ways to make my job easier and more efficient. This app looks very promising. Netbook: No CD Drive? No Problem.